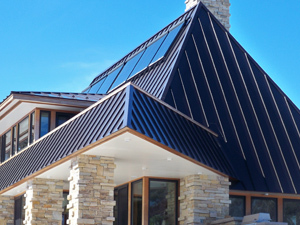 Specializing in standing seam metal roofs and custom flashing. A roof we did that was featured in Tree House Masters premier show. For many years, our goal has been to ensure the complete satisfaction of every customer, while offering knowledgeable and friendly service at competitive rates. Our hope is that you'll feel confident in our ability to meet all of your expectations, and know that our customers are always our number one priority. Custom Metal Roofs Of Maine, Inc., conveniently located in Lewiston, ME, has been providing professional long lasting metal roofs since August of 1988. They are a well-known business that drives in professionalism and clean-cut work to make every home and business they work on look great. However, if you don't see exactly what you're looking for here, please contact us and we will do everything we can to satisfy your needs. Please take a moment to browse through our site to learn more about our company and how we can show you the Custom Metal Roofs Of Maine, Inc., difference. If you have any questions or comments, please feel free to contact us. We look forward to hearing from you soon. We're in the office 7:00 am to 5:00 pm Monday through Friday — give us a call or stop in. Click HERE to download the standing seam installation manual. Contact us HERE to get a free estimate. Providing professional long lasting commercial and residential metal roofs since August of 1988.